Established circa 1837, Re-Discovered in 2006, we strive to produce products the way they were meant to be. Our pure, raw honey is made right here on the premises. 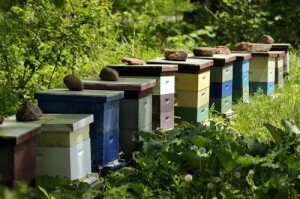 We have seventeen hives and continue to grow! We are a small family operated farm, located on scenic Route 159, Windsor, Conn. Our apiary allows us to provide Raw Honey and other handmade beeswax products such as candles, lip balm, and hand cream throughout the year. Seasonally, we offer fresh picked vegetables, as well as small batches of jellies and jams. Produce is available, when in season, on our honor system farm stand. The rest of our products can be ordered through our website or call to make arrangements for pick up or delivery. Our Mission at Forgotten Acres Farm is to not only provide locally grown farm fresh products supporting a higher quality of life, but to also educate consumers on the benefits of consuming locally grown food allowing them to make more informed and healthier choices. Most importantly, we believe in being part of a locally sufficient food resource which, in turn, builds a stronger community. We thank you for visiting and hope you come back often!